It is crazy to think it is already time to plan for the next flu season, especially when people are still suffering from this flu season. 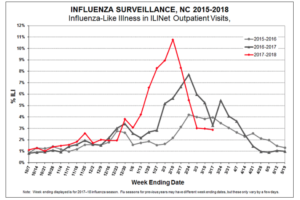 According to the CDC, the flu accounted for 328 deaths in North Carolina this flu season (10/1/2017 – 3/17/2018) and as you can see to the right, is still not out of the area. Out of those four shot dodger excuses, I would consider myself The Multitasker. It is not that I am afraid of the shot or don’t see the importance – I don’t have time! I’m constantly making excuses not to get it until I’m headed to do the doctor with the flu and they ask, “did you get your flu shot yet?” oops. That’s why this year – we are playing a part in crushing this “shot dodger” excuse. We are scheduling flu clinics where you work! According to the CDC, the flu causes U.S. employees to miss approximately 17 million workdays to the flu, at an estimated $7 billion a year in sick days and lost productivity. Flu clinics are a proven cost-effective strategy to increase productivity, reduce overall absenteeism, and prevent direct health costs. So why not? Plan ahead for the next flu season (it is coming faster than you think)! Sign up on our form to request for us to come host a clinic at your place of work. Promote corporate wellness and help keep your office healthy! If you have one of the other three shot dodger excuses – check out some of the common misconceptions of the vaccine here.